In the CES 2012 event, Intel has talked a lot about the future of the ultrabooks and their competitions with the Apple’s MacBook Air. Intel has also announced at CES that more than 75 ultrabook’s are coming in the market with Intel’s powered processors to compete with Apple’s Macbook Air. While all the vendors were busy in revealing products at the show, we come across to the real Macbook Air ultrabook killing concept called Nikiski, a hybrid ultrabook which carries the transparent touchpad, and works like a half iPad and act as ultrabook. The Nikiski gadget by Intel act like an ultrabook, but with a weird design layout, and carries the transparent trackpad with the similar length of the keyboard on the machine, for surely it looks ugly, but it comes up for some work: the transparent trackpad illustrates the screens at the back panel of the ultrabook and starts acting like a half tablet with Windows 8 UI, and allows you to make contact with your stuff with closed lid on your ultrabook. However, at the moment it is just a prototype of the product, and for surely Intel will work on the concept with its partners this year to make it reality with great physical layout. The concept seems to be great for those who could not able to carry both tablet and ultrabooks at once, as well as it opens the new door in the ultra-slim netbooks. 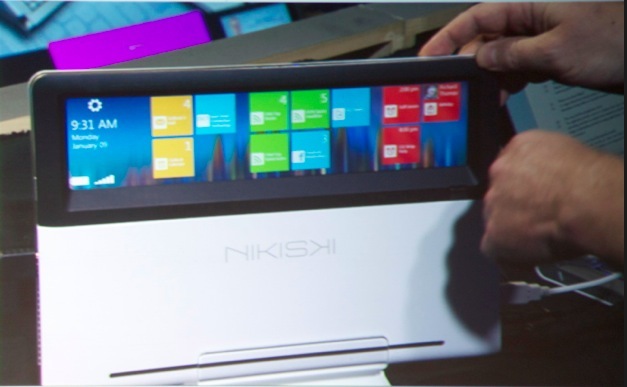 The Nikiski is act like a Windows 8 tablet, while the lid closed, and as well as transfers the current going process from Windows 8 to Windows 7. Like you have opened a web page on tablet mode, and after sometime you wish to enter data to the page, you can simply do it by opening the lid; the page will be automatically open on the Windows 7 default browser. The Nikiski is a MacBook Air that wants to be half an iPad.